Stem: erect, ascending or decumbent, glabrous, hairy, or glandular. Leaf: simple, generally alternate, tips acute, acuminate, or mucronate; basal generally in rosette, entire, toothed, or 1--2-pinnate-lobed; cauline generally reduced. Inflorescence: flowers 1--3 in bract axils. Flower: calyx membranous between lobes, lobes < tube, membranes glandular, splitting or expanding in fruit; corolla > calyx, lobes generally < tube, generally ovate, acute, acuminate. Fruit: spheric to ovoid; chambers 3; valves separating from top. Seed: 3--many, yellow to brown, not gelatinous when wet. Habit: Annual. Stem: 7--23 cm, branches ascending, 1--several, thread-like, glandular-puberulent. Leaf: basal 1--6 cm, lanceolate or widely linear, toothed or lobed, lobes rounded, mucronate, generally < leaf axis width; cauline linear, entire. 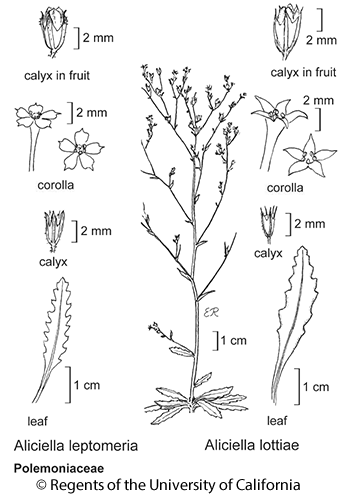 Flower: calyx 2--3 mm, lobe tips thickened; corolla 4--7 mm, tube 1.5--3 × calyx, thread-like, purple, throat yellow, lobes truncate-acuminate, white adaxially, purple abaxially; stamens, style +- exserted, pollen white. Fruit: 3--5 mm, = calyx, narrowly ellipsoid. Seed: many. Chromosomes: 2n=34,36. Citation for this treatment: J. Mark Porter 2012, Aliciella leptomeria, in Jepson Flora Project (eds.) Jepson eFlora, http://ucjeps.berkeley.edu/eflora/eflora_display.php?tid=79238, accessed on April 19, 2019. GB, DMtns (uncommon); Markers link to CCH specimen records. Yellow markers indicate records that may provide evidence for eFlora range revision or may have georeferencing or identification issues. Purple markers indicate specimens collected from a garden, greenhouse, or other non-wild location.